Optimum Nutrition is a brand that needs no introduction. The company produces a range of well-known supplements, including Gold Standard Whey and Gold Standard Casein, and are amongst the most popular supplement manufacturers on the market. 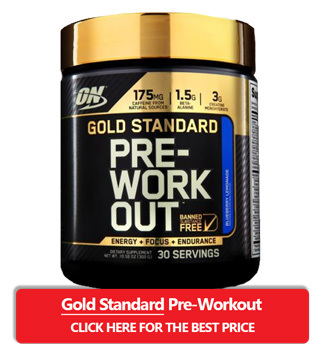 Aside from their range of protein shakes, ON also sells pre-workout supplements - including Gold Standard Pre-Workout. This is a mid-range PWO supplement that's designed to boost energy levels, increase muscular endurance and allow you to get more out of your workout. 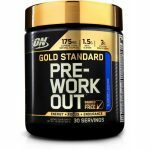 To find out whether it matches the quality of other PWOs, I wanted to review Gold Standard Pre-Workout in more depth. Does it contain scientifically backed ingredients? Is it worth the money? And does it really improve your workout? Keep reading my Optimum Nutrition Gold Standard pre-workout to find out. How Effective Is This Pre Workout? Do I Need to Cycle It? Where Can I Buy Gold Standard? Is it Ever On Sale? 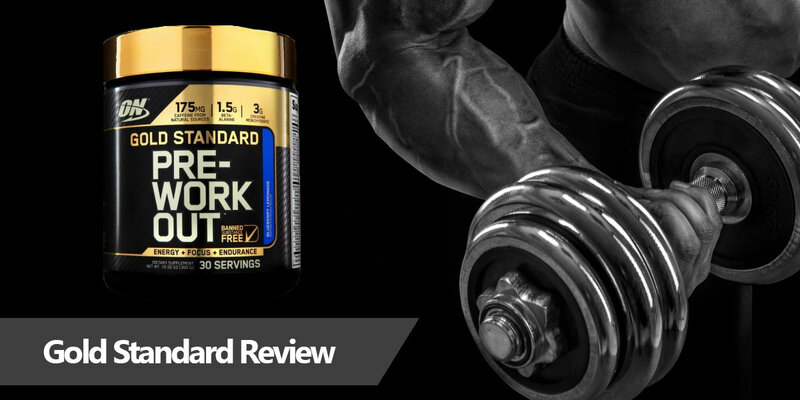 The aim of Gold Standard pre-workout, according to the manufacturer, is to provide "amplified energy, focus and enhanced endurance" so you can bust out more reps and sets. These are hardly unique claims in the pre-workout market. So, what makes this PWO different from the rest? Firstly, it can be considered a mid-range supplement when it comes to price per dose. At the time of writing, 60 servings costs around $48, which is approximately $0.80 per serving. This is average for a pre-workout supplement, but much less than many of the top supps from brands such as PreSeries, 4Gauge and Legion Athletics (which can cost up to $2 per serving). This lower price comes at a cost, however, as the doses aren't as high. With this in mind, I wanted to see exactly how the label compares to top-rated PWOs. Gold Standard pre-workout contains most of the ingredients you would expect, including L-citrulline, caffeine, beta-alanine and creatine. There are also a range of vitamins, such as B12, B6, D and folic acid. An impressive ingredients list is only part of the equation though. The dose of each ingredient makes a huge difference to whether the supplement is effective. This is where Gold Standard lags behind the best pre-workouts on the market. While some of its ingredients are dosed at clinically-backed levels, others (particularly L-Citrulline) are under dosed. Lower doses are understandable when you consider Gold Standard costs less than half the price per serving of other pre-workouts. But I'll discuss the various ingredients and doses in more detail to help you decide whether the trade-offs are worth the monetary savings. A small section of the ingredients list is also hidden behind a "proprietary blend" label. Fortunately, only the doses of Astralagus and Panax are combined - all the other ingredients are individually listed with doses - so I don't see this as a major drawback. Creatine Monohydrate (3000mg). Creatine is proven to provide several workout benefits, including improved cognition, enhanced muscle growth and reduced fatigue. Most people take 3000-5000mg per day, so Gold Standard's generous dose could replace most of your creatine intake. Beta-Alanine (1500mg). This amino acid helps to replenish carnosine in muscles, which can increase capacity and reduce fatigue. It's also safe and proven to be an effective pre-workout supplement. While 1500mg isn't a tiny dose, it's smaller than the 5000mg used in most studies - and much less than the 4800mg found in Legion Pulse. L-Citrulline (750mg). I'm a big fan of citrulline as a pre-workout supplement, as it acts as a nitric oxide booster. This provides bigger pumps, greater muscle endurance and improved athletic performance. The 750mg dose provided by Gold Standard is much lower than the clinically backed 6000-8000mg range though, so it can't provide the full benefit. Caffeine (175mg). Caffeine is one of the most effective ingredients for increasing energy and endurance. While Gold Standard pre-workout doesn't contain the huge 300mg dose found in some supplements, 175mg is enough to provide a fast boost without the jitters. A downside is that it doesn't include L-Theanine, which has a synergistic effect with caffeine. AstraGIN Proprietary Blend (25mg). The only proprietary blend contains 25mg of Panax notoginseng extra (root) and Astragalus membranaceus extract (root). This is part of the muscle matrix, and is designed to boost absorption of amino acids and vitamins. Vitamins. A single serving contains the daily recommend value of vitamin B12, D, B6, thiamin, niacin and pantothenic acid. It also includes 50% of folic acid's daily value. This isn't going to make an instant difference to your workout, but adequate levels of these vitamins can improve hormonal health and energy levels. If your diet already contains plenty of these vitamins then this section of the label can be ignored. Other Ingredients. Several other ingredients are included. Two of the most important are L-Carnitine and L-Tyrosine, with the latter helping to improve mood and reduce stress. There are a couple of ingredients missing that I would have liked to be included. The first is Betaine, which helps boost muscle strength and endurance. L-theanine would also have been useful, as this can smooth the effects of caffeine. It's also worth noting that Gold Standard pre-workout contains a mixture of artificial and natural flavors. If you want a pre-workout with no artificial sweeteners, check out ALTIUS. On the plus side, a serving only contains 5 calories. Considering the low price per serving compared to Legion Pulse and 4Gauge, Optimum Nutrition Gold Standard provides a decent range of ingredients that certainly provide a noticeable boost. It can't match the best pre-workouts, however, due to the low doses and lack of several important ingredients. There are a variety of flavors available, including Blueberry Lemonade, Fruit Punch, Green Apple and Watermelon. While you'll need to experiment to find your favorite choice, Gold Standard pre-workout tastes better than many products on the market. It also mixes relatively easy with water, which isn't the case with many pre-workouts! A single serving of Gold Standard pre-workout contains 10 grams of supplement. This is a relatively small scoop, especially compared to alternatives like Pre Jym which contain 26g per scoop. You should take the supplement 20-30 minutes before the start of your workout. This allows time for the ingredients, including caffeine, to kick in. If you want a bigger boost, there is the option of taking a double dose. This means you're getting a big dose of caffeine and 3000g of beta-alanine, however, so the chances of jitters or itching are higher. You should always start with one scoop (or less) to assess your tolerance levels before you go for a double dose though. So, we've taken a look at the ingredients profile, dosage, mixability and taste - but what positive effects does this pre-workout actually provide? Firstly, the 175mg of caffeine is going to hit most people with a near-instant boost in energy and focus. This, combined with the ​L-Tyrosine and L-Carnitine, can certainly help you feel more in the zone during your workout. It doesn't provide the same boost in nitric oxide production as the best pre-workouts though. While the 750mg of L-Citrulline may have a small effect, it is far below the clinically-backed dose of 6000mg. For this reason, don't expect a huge pump from this pre-workout. Despite these drawbacks, the ON Gold Standard Pre-workout supplement does provide a noticeable boost in your workout energy, focus, motivation and endurance. If you want a relatively inexpensive PWO that helps you push out that extra rep, it's an option to consider - especially if taste is important to you. It's also great that 3000mg of creatine is included per serving. This is one of the most important workout supplements, so getting it in your PWO can offset the cost of buying it separately. Any workout supplement can potentially cause side effects. This is why it's important to discuss any new supplement with your doctor before you start taking it. I also recommend starting with a low dose to assess your tolerance - particularly if you have an existing medical condition. With that said, the ingredients in ON Gold Standard are popular in pre-workouts and are unlikely to result in serious side effects. The most common side effects of pre-workouts with stimulants are jitters, nervousness, anxiety and poor sleep quality. Gold Standard doesn't contain as much caffeine as many pre-workouts, although the 175mg dose could still cause side-effects depending on your tolerance. Beta-alanine can also sometimes cause a harmless tingling in the skin. This usually isn't anything to worry about, but some people find it annoying. The label instructs that people with a medical condition, who are under 18, are pregnant, trying to get pregnant or are nursing should not consume this pre-workout. Pre-workouts should nearly always be cycled for at least a week every 2-3 months - especially if they contain caffeine. It's also a good idea to have a "caffeine-free" day each week along with low-caffeine consumption on two more days. ON Gold Standard pre-workout can be bought from a variety of retailers, including Bodybuilding.com and Amazon. It's also sold on the Optimum Nutrition website. In short, Gold Standard isn't a bad pre-workout - but it's not perfect either. It's underdosed in some ingredients (particularly L-Citrulline) and can't match the best pre-workouts for pump and power. With that said, it can still provide a boost in endurance, focus and energy. It also offers decent value for money - especially with the generous dose of creatine - and tastes great. So, if you're on a tight budget, it might be an option to consider. The information on this website does not constitute professional medical or healthcare advice or diagnosis. Under no circumstances should it be used as medical advice to to diagnose, prevent or treat any illness, disease or medical condition. None of the content has been reviewed or written by a medical professional, and you use the information at your own risk. It is your responsibility to read the label and instructions before using any supplement or other product. You should ALWAYS consult your doctor before using a supplement you see on this website, as not all supplements are suitable for everyone. All the brands, products and logos on this website are trademarks of their respective companies. At BeastWorkouts.com, we spend hundreds (if not thousands) of hours researching the products we review. When you buy a product through links on our site, you may help us by earning us a commission. This doesn’t affect the price you pay. If you click a link on our site, you should assume that we get a commission. Read our full disclaimer. BeastWorkouts.com is a participant in the Amazon Services LLC Associates Program, an affiliate advertising program designed to provide a means for sites to earn advertising fees by advertising and linking to Amazon.com. Note: Prices are subject to change. The prices we show on this website were correct when the corresponding article was updated, but we do not guarantee the vendor hasn’t changed their prices.